The minister has informed that these services will facilitate nearly 3.54 crores contributing members, 49.22 lakh pensioners and 6.1 lakh employers. It is estimated that a total number of nearly 1.80 crore UAN are activated, 58.72 lakh UAN are seeded with AADHAAR and 1.82 crore UAN are seeded with Bank Account. EPFO’s new mobile application is available on EPFO’s website. Click on the below image to download PF mobile app. Mobile Application is useful to employers, employees and pensioners. The EPF members / subscribers can activate UAN (Universal Account Numbers) from the comfort of their mobile phones. 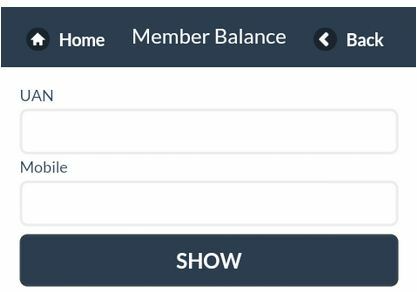 As an EPF subscriber you can access your EPF account for viewing monthly credits through the passbook option and can also view your EPF account details available with EPFO. The EPF pensioners have been given the facility to access the pension disbursement details through this mobile app. The employers can view the PF remittance details. A new SMS based UAN activation service which enables members to activate their accounts by sending an SMS to 7738299899 thus further making the activation process easy. Once activated, the member becomes eligible to all services envisaged in UAN programme such as credit alerts, passbook etc. This new service is especially helpful to such members who may not have easy access to computers or smart phones. EPFO has already in place a Short Code SMS service which has enabled the members in knowing their details along with contribution and PF Balance through an SMS at 7738299899. EPFO has also launched the Missed Call service for all the UAN activated EPF subscribers. The EPF member can give a missed call at 011 2290 1406 to know the EPF balance and other EPF a/c details. How to transfer your EPF funds online through OTCP & UAN Member Portal? How to track in-operative EPF account through EPFO’s online Helpdesk? My employer seeded wrong KYC details(bank a/c number, PAN) against my UAN. Later I myself uploaded correct details and employer approved them. But now, my approved KYC is showing both older incorrect kyc and the newly updated correct KYC. There is no ‘delete’ option on KYC page in epfo. Which kyc will be considered when I withdraw my PF ? (ps – I don’t wish to withdraw right now, only after my retirement which is several years from now). Dear RevK ..You can request your employer to delete the unwanted row. They may in-turn request the EPFO to get this done. Kindly check with your employer. I have already spoken to my employer and EPFO office. Both are saying that there is no option for them to delete a KYC once it is approved. I’m not sure whether this is correct or not? My wife was working with one firm where she has resigned in April’2009 due to personal reasons and not joined anywhere else. This placed she has worked for almost 2.5 year and now we have decided to withdraw he PF amount. She has her PF number and we also submitted PF withdrawal documents to company and which they are saying will take almost 4 months to get credit of PF amount. Can we get details of her PF account balance by online or mobile app (She doesn’t have UAN no. and can she activate UAN account with out company’s help). Yes, she can generate & activate UAN number by herself. Kindly read: Generate UAN number online now! Great Info.. Thanks for keeping us updated with latest happenings.. Keep up good work..
BTW the missed call service is not yet active. I have tried it and it’s not working as of now.